William Matousek passed away at the Sanford Medical Center in Sioux Falls on Sept. 14, 2018 following complications after a hard fall earlier in the month. A memorial service will be held on Friday, Sept. 21, 2018 starting at 10 a.m. at the Carter Gospel Fellowship Church in Carter, South Dakota. Bill was born in Sioux City on Jan. 26, 1935 to parents William and Louise (McDonald) Matousek. He moved with his parents to Carter, SD the following year where his father engaged in farming and ranching. He attended The Carter Elementary School (1949), Winner High School (1953), and the University of South Dakota (1957). He served as a Lieutenant in the United States Army intelligence services in Providence, RI for two years after graduation from USD. Following separation from the military, Bill settled in Boston where he pursued a life of professional diversity and international travel. Part of this time was spent in the Arctic Circle doing research. Bill returned to South Dakota in 2000 and settled in the Carter and Winner area. He managed his ranch lands and was a great supporter of the Tripp County area. He was also active in supporting the University of South Dakota and took part in local charity fund raising events. Bill and his brother Bob were both graduates of the University of South Dakota (USD) and the two of them funded many projects, scholarships, and other ventures at the university. However, their greatest satisfaction came from supporting the USD John T. Vucurevich Children’s Center and its preschool that was named in honor of their parents, Bill and Louise Matousek. Bill was the epitome of generosity and the betterment of our entire community was extremely important to him. If there was a cause in our community that was in need, Bill was the first to commit to helping in any way he could. Bill was one of the founding board members of the Tripp Co. Community Foundation and served as chairman until 2017. Through the foundation he established the Harold Smith Memorial Scholarship fund to recognize Harold for his years of teaching students at the Winner High School. He also established the William J. Matousek & Marjory E. Calderia Fund to be used for grant making for a variety of community organizations needs in the Tripp County area. Bill was very proud of his roots in the Tripp County area and especially of his alma mater, WHS! Bill was the 1952 Homecoming Warrior and every year was proud to attend roll call for the class of 1953. Everyone remembers him as the voice of the Tripp County Community Foundation as each year he took liberties with the microphone at roll call to put a plug in for the foundation. In 2017 Bill was humbled and honored to be selected as the WHS Homecoming Parade Marshal. Bill will be forever remembered as the face of the Red Kettle campaign of the Salvation Army in our area. During the holidays he spent countless hours lining up youth and adult volunteers to ring the Salvation Army bell in town. This was important to him and many hours of his own time were spent ringing the bells. No philanthropic effort was too big or small for him to tackle. There was no greater supporter of the Tripp County community than Bill. Everything he did, he did quietly, behind the scenes, not looking for self-promotion or fame. He did these things because of his great compassion to help others and high hopes for the future of our community. He will be greatly missed by all of his friends in the Tripp County area. 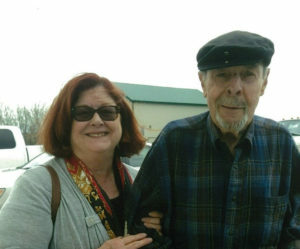 He was preceded in death by his parents, his life-partner Marjory Caldeira (2017), and his younger brother Robert (Bob, 2018). He is survived by his brother Jan of Denver, CO, sister-in-law Colette Clowes Matousek of Tiburon, CA, nephew Peter Matousek & Kristin Unger, niece Kathryn Steinberg, their children, along with numerous cousins. His family appreciates his faithful neighbors, his friends, his professional associates, and his medical team for the support and encouragement through life and in death. The family ask that you make any donations in his memory to your local church or the charity of your choice — which might include: The Salvation Army, Tripp County Community Foundation – William J. Matousek & Marjory E. Caldeira Fund, PO Box 111, Winner, SD 57580.